Chicago Hopes To “Solve” Record Pension Deficit With Creative Solution: More Debt, at zerohedge.com. Is it a good idea to use a new credit card to pay off your maxed out credit card? Paying off debt with more debt doesn’t work in the real world. Oh by the way, decisions by these same big government central planners are what caused the pension problem in the first place. Walk Softly – Big Brother Wields A Big Stick, at theburnigplatform.com. Financially sinking State governments are making it difficult for residents to move out of their States. They are trying to escape these high taxes. Central planners must think you and I are permanent residents of their State. DO THESE ARTICLES HAVE ANYTHING IN COMMON? Dem Congressional Candidate Has Spent Decades Pushing For Population Control, by Paul Bois, at dailywire.com. This central planner doesn’t understand that in order for the leftist ideology to survive you need a growing population to prop up the Ponzi scheme that is the our socialist welfare system. This idea couldn’t possibly lead to a different problem in the future, could it? Read this article. Uproar Over “Wacky” Plan To Start Baby Boom In China By Taxing Adults Under 40, at scmp.org. China had a one-child policy for four decades. It ended three years ago. This one-child policy has produced an aging population and a shrinking workforce. China needs more people to produce enough to prop up their communist Ponzi scheme. They are trying to incentivize individuals to have more children. They are doing this by subsidizing families who have more than one child with money taxed away from people under forty years old. Communist central planning created the problem they are now trying to solve. San Francisco “Poop Patrollers” Make $185,000, at zerohedge.com. San Francisco’s central planners created the $#!++y mess they now have to clean up. Unfortunately they are cleaning up the symptom their previous economic policies produced. Economic central planning comes at a high cost that central planners ignore. Until they no longer can. Ocasio-Cortez Claims Solidarity With Cab Drivers – While Campaign Buys Rides From Uber, at economicpolicyjournal.com. Please read Alexandria’s statements in this article. Now ask yourself; “Do I want this self avowed socialist central planner making policies about economic activity”? She doesn’t understand the basic law of supply and demand. And she graduated from Boston University College of Arts and Sciences with a bachelors degree in economics and international relations. I bet her economic ignorance says more about this college than it does about her. 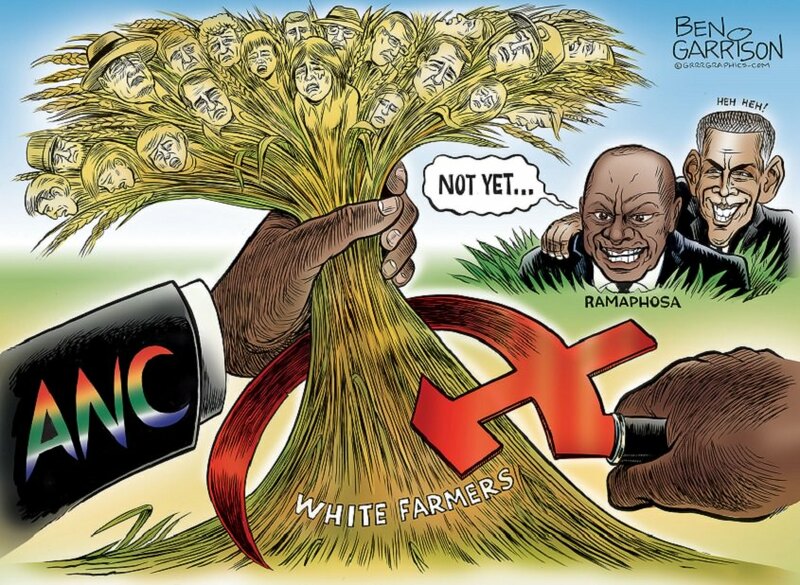 South Africa’s Land Confiscation: Socialism By Another Name, by Ryan McMaken, at mises.org. Property rights not being protected leads to dire economic consequences. Allowing land to be confiscated and given away creates a couple of problems. 1) Three things needed for economic growth; investment, capital and entrepreneurship will decline if property right are not protected. A lower standard of living will follow. 2) The knowledge (human capital) the previous farmers had accumulated can’t be transferred to the new squatters. Agriculture production will decline. But once again government central planners know best. “What A Disaster”: Chaos Returns To Venezuela One day After Massive Devaluation, at zerohedge.com. Decades of socialist central planning has put Venezuela in a position from which it can’t escape. Hyperinflation is being tried as a last resort. It won’t work. The economic situation in Venezuela is where government central planning of an economy eventually leads to if it is not stopped. Destroying the Venezuelan economy has lead to migration problems for neighboring countries. Ecuador, Peru Tighten Entry Requirements For Venezuelans As Influx Swells, by Alexandera Valencia, at usnews.com. And this article.Brazil Deploys Troops To Venezuela Border After Migrant Chaos – “This Is Going To Turn Into War!” at zerohedge.com. The Big Self-Driving Car Problems: Artificial Intelligence Can’t Deal With Pedestrians, at economicpolicyjournal.com. When I told a friend of mine about a news article that was wondering why a self-driving car got into a wrecked. He said: “Seriously! Maybe it wrecked because no one was driving”. I have asked this question before; what do self-driving cars do when a deer runs across a four lane highway? This article brings up the same point about the unpredictable elements a self-driving car can’t be programmed to deal with. This is an example of why it is hard to centrally plan anything that involves human action. A self driving cars isn’t like a chemistry experiment where every element always act the same way. Also, what happens when the technology, which is created by flawed human beings, malfunctions. A driver has some options when his brakes fail. A self driving car has no options when the technology has a hiccup. Instructor Tries To Quarantine Gun Owners In Back Of Class, by Frances Floresca, at campusreform.org. The good news is the university overruled the teaching assistant. Some Inconvenient Gun Stats For Libs, at theburningplatform.com. The US is third in murders throughout the world. If you remove, Chicago, Detroit, Washington D.C, St Louis, and New Orleans the US is then 189th out of 193 countries in the entire world. What do these five cities have in common? Strict gun control laws. 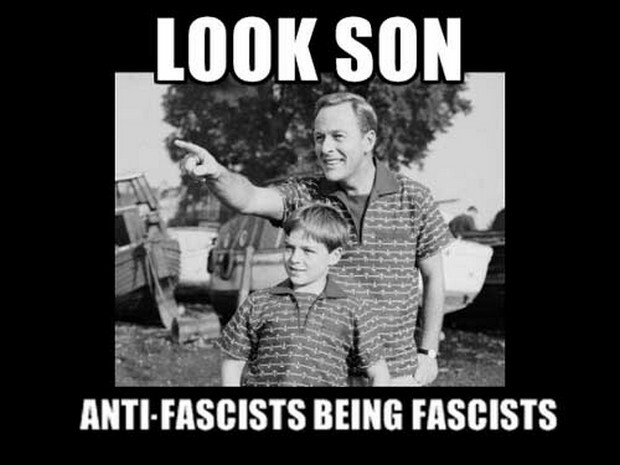 Antifa Violently Attacks Man Holding Flag – Except He’s A Bernie Supporter, at zerohedge.com. No comment needed. If Paul Manafort Is Going To Prison, Tony Podesta Should Be Joining Him, at zerohedge.com. Lady Justice has pulled off her blindfold. Now the only thing that matters is what side are you on. Are you part of the status quo or are trying to dismantle the status quo. In America today, does the rule of law exist? Standards Go Out The Window As Employers Struggle To Fill Jobs, at zerohedge.com. There are more jobs than willing workers. Employers are overlooking previous requirements such as college degrees and work experience. At this moment anyone who is not employed probably isn’t a motivated worker. Most people today complain about receiving poor service from businesses. This makes my point because bad service usually means full employment. Does A Fall In Unemployment Lead To Stronger Economic Growth? by Frank Shostak, at mises.org. More people being employed doesn’t lead to economic growth. 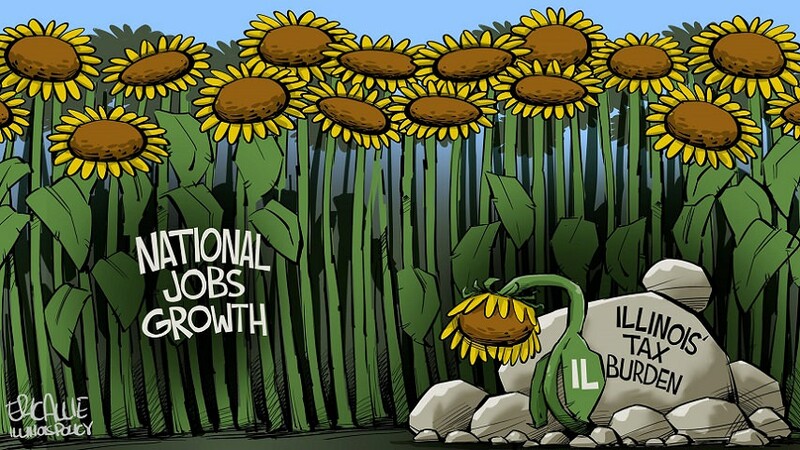 Stronger economic growth leads to more employment. A job has to be a productive job for the economy to create wealth. A job created by Government spending or a job created by Federal Reserve money printing destroys wealth. I have been against Trumps tariffs because their cost is paid by your own citizens. Economic laws also tell us they hurt economic growth. I understand that Trump is trying to get countries to lower tariffs and trade restrictions by threatening them with corresponding tariffs and trade restrictions. This is a dangerous gambit. Here is how I think Trump sees this situation. He thinks the U.S can take, lets say, thirty punches before it feels the pain. He also thinks that the EU, Mexico, Canada and China et al, can only take ten or fifteen punches before they feel the pain. He thinks these other countries also know this. He believes they will make concessions before real harm is done. It is like a game of poker except he doesn’t bluff. I think these countries are beginning to understand Trump isn’t bluffing. A month ago the EU renegotiated some tariffs and trade restrictions. If you look at that along with these two articles: (China To Send Delegation For US Talks To Avert Trade War, at theguardian.com. and Trump Announces US-Mexico Trade Agreement As He Terminates NAFTA; Canada Left Out, at zerohedge.com.) He may be moving these countries off of their stances on tariffs and trade restrictions. I tip my hat if he pulls this off before the negative economic consequences take root. "THE COORDINATION OF MENS ACTIVITIES THROUGH CENTRAL PLANNING OR THROUGH VOLUNTARY COOPERATION ARE ROADS GOING IN VERY DIFFERENT DIRECTIONS, THE FIRST TO SERFDOM AND POVERTY THE SECOND TO FREEDOM AND PLENTY." "You Never Let A Serious Crisis Go To Waste." Let's Take A "Serious" Look At Conspiracy Theories. "THERE IS NO SUBTLER, NO SURER MEANS OF OVERTURNING THE EXISTING BASIS OF SOCIETY THAN TO DEBAUCH THE CURRENCY. THE PROCESS ENGAGES ALL THE HIDDEN FORCES OF ECONOMIC LAW ON THE SIDE OF DESTRUCTION, AND DOES IT IN A MANNER WHICH NOT ONE MAN IN A MILLION IS ABLE TO DIAGNOSE." F.A. Hayek - "Since the value of freedom rests on the opportunity it provides for unforseen and unpredictable actions, we will rarely know what we lose through a particular restriction of freedom." Matthew McCaffrey - "Building a freer society means winning the battle of ideas, not the empty contests put on by the central Government every four years. Freedom is never obtained by endorsing the least offensive applicant for the position of chief villain." Ludwig von Mises - "The middle system of property that is hampered, guided, and regulated by government is in itself contradictory and illogical. Any attempt to introduce it in earnest must lead to a crisis from which either Socialism or Capitalism alone can emerge." F. A. Hayek - "While it may not be difficult to destroy the spontaneous formations which are the indispensable bases of a free civilization. It may be beyond our power deliberately to reconstruct such a civilization once these foundations are destroyed." Murray Rothbard - "The market promotes and rewards the skills of production and voluntary cooperation. The Government enterprise promotes the skills of mass coercion and bureaucratic submission...and those who get to the top will be those with the most skill in that particular task." John Adams - "Government is instituted for the common good: for the protection, safety, prosperity, and happiness of the people. And not for profit, honor, or private interest of any one man, family, or class of men..."
Milton Friedman - "Underlying most arguments against the free market is a lack of belief in freedom itself." Chris Rossini - "The state is a monster that destroys. Those who gain control of the levers, choose the targets." Murray Rothbard -"It is no crime to be ignorant of economics...but it is totally irresponsible to have a loud and vociferous opinion on economic subjects while remaining in this state of ignorance." Murray Rothbard -"Democracy can be only a possible route toward a free society rather than an attribute of it. In a purely free society there would be nothing for democratic electors to vote about." Robert Bradley Jr. - "When Government tries to pick winners and losers, it typically picks losers. Why? Because the Free market consumers pick winners to leave the losers for Government." Benito Mussolini - "Fascism should more appropriately be called corporatism because it is a merger of state and corporate power." Ludwig von Mises - "Men must choose between the market economy and socialism....some agency must determine what should be produced. If it is not the consumer by means of demand and supply on the market, it must be the Government by compulsion." F. A. Hayek - "The curious task of economics is to demonstrate to men how little they really know, about what they imagine they can design." Detlev Schlichter - "Any intervention in the market (by the state) must direct resources away from how private owners would have employed them and toward how state officials and their economic advisers would like to see them employed." Henry Hazlitt - "The question is not whether we wish to see everybody as well off as possible....the real question concerns the proper means of achieving it. And in trying to answer this we must never lose sight of a few elementary truisms. We cannot distribute more wealth than is created. We cannot in the long run pay labor as a whole more than it produces." Murray Rothbard - "Whether or not man lives at the level of poverty or abundance depends upon the success that he and his ancestors have had in grappling with nature and in transforming naturally given resources into capital goods and consumers goods.... Free markets tend to lead to abundance for all of its participants.... violent intervention in the market and a hegemonic society tend to lead to general poverty." Ludwig von Mises - "Inflation and credit expansion are the means to obfuscate the fact that there prevails a nature-given scarcity of the material things on which the satisfaction of human wants depends. The main concern of capitalists private enterprise it to remove this scarcity as much as possible and to provide a continuously improving standard of living for an increasing population.....but however remarkable these improvements may be, there will always be a strict limit to the amount that can be consumed without reducing the capital available for the continuation and, even more, the expansion of production." Ludwig von Mises - " It is impossible to grasp the meaning of the idea of sound money if one does not realize that it was devised as an instrument for the protection of civil liberties against despotic inroads on the part of Governments. Ideologically, it belongs in the same class with political constitutions and bills of rights." Murray Rothbard - "To reduce the working population while the consuming population remains undiminished is to lower the standard of living." Murray Rothbard - "Increasing the money supply confers no social benefit. It relieves no economic scarcity. It simply benefits some at the expense of others." Ludwig von Mises - "Political ideas that have dominated the public mind for decades cannot be refuted through rational arguments, they must run their course in life and cannot collapse otherwise than in great catastrophe." Milton Friedman - "A society that puts equality- in the sense of equality of outcome- ahead of freedom will end up with neither equality nor freedom. The use of force to achieve equality will destroy freedom, and the force introduced for good purposes, will end up in the hands of people who use it to promote their own interests." F. A. Hayek - "It has already been suggested that it is not necessary, for the working of this free market capitalist system, that anybody should understand it. But people are not likely to let it work if they do not understand it." C. S. Lewis - "Of all tyrannies, a tyranny sincerely exercised for the good of its victims may be the most oppressive. It would be better to live under robber barons than under omnipotent moral busybodies. The robber barons cruelty may sometimes sleep, his cupidity may at some point be satiated; But those who torment us for our own good will torment us without end for they do so with the approval of their own conscience." Ludwig von Mises - "For the naive mind there is something miraculous in the issuance of fiat money. A magic word spoken by the Government creates out of nothing a thing which can be exchanged against any merchandize a man would like to get." Ludwig von Mises - "Many think that governments are free to achieve all they aim at without being restrained by an inexorable regularity in the sequence of economic phenomena....they maintain that the state is God." George Gilder - "Under capitalism, economic power flows not to the intellectual, who manipulates ideas and basks in their light, but to men who gives himself to his ideas and tests them with his own wealth and work." Thomas Sowell - "Perhaps the greatest achievement of market economies is in economizing on the amount of knowledge needed to produce a given economic result. That is also their greatest political vulnerability." Ludwig von Mises - "Anti capitalistic policies sabotage the operation of the capitalist system of the market economy. The failure of interventionism does not demonstrate the necessity of adopting socialism. It merely exposes the futility of interventionism. All those evils which the self-styled "progressives" interpret as evidence of the failure off capitalism are the outcome of their allegedly beneficial interference with the market." F.A. Hayek - "The battle for freedom must be won over and over again, the socialists of all parties must be persuaded or defeated if they and we are to remain free men." F. A. Hayek - "Planning, or central direction of economic activity, presupposes the existence of common ideals and common values; and the degree to which planning can be carried is limited to the extent to which agreement on such a common scale of values can be obtained or enforced." Thomas Sowell - "In political competition accurate knowledge has no decisive competitive advantage, because what is being sold is not an end result but a plausible belief about a complex process"
Thomas Sowell - " Taxing away what other people have earned, in order to finance one's own moral adventures via social programs, is often depicted as a humanitarian endeavor, while allowing others the same freedom and dignity as oneself, so that they can make their own choices with their own earnings is considered pandering to greed. Greed for power is no less dangerous than greed for money, and has historically shed far more blood in the process." Peter Earle - "In a world of infinate desires and limited means, choices must be made; a study of history and economics reveals that, while markets make no promises, they never lie. The only choice is whether distribution, or redistribution as the case may be, is to be accomplished by the organic, apportioning hand of the price system, or by the corrupt, spoilative claw of states." Thomas Jefferson - "....To preserve our independence, we must not let our rulers load us with public debt....we must make our choice between economy and liberty or confusion and servitude....if we run into such debts, we must be taxed in our meat and drink, in our necessities and comforts, in our labor and in our amusements.... if we can prevent the Government from wasting the labor of the people under the pretense of caring for them, they will be happy." F. A. Hayek - "The democratic statesman who sets out to plan economic life will soon be confronted with the alternative of either assuming dictatorial powers or abandoning his plans." Jean Baptiste Say - "...The encouragement of mere consumption is no benefit to commerce, for the difficulty lies in supplying the means, not in stimulating the desire of consumption; and we have seen that production alone, furnishes those means. Thus, it is the aim of Good Government to stimulate production, of bad Government to encourage consumption." Ludwig von Mises - "The middle-of-the-road policy is not an economic system that can last. It is a method for the realization of socialism by installments." Thomas Sowell - "What is politically defined as economic planning is the forcible superseding of other people's plans by Government officials." Thomas Sowell - "The market is simply the freedom to choose among many existing or still to be created possibilities. The Government establishes an army or a post office as the answer to a given problem.... The diversity of personal tastes insures that no given institution will become the answer to a human problem in the market." Thomas Sowell - "Just as a poetic discussion of the weather is not meteorology, so an issuance of moral pronouncements or political creeds about the economy is not economics." 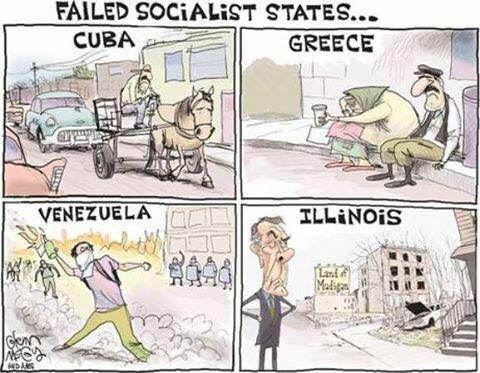 Paul Craig Roberts - "We should all be thankful to the Soviets, because they have proved conclusively that socialism doesn't work. No one can say they didn't have enough power or enough bureaucracy or enough planners or they didn't go far enough." Alexis de Tocqueville - "Democracy extends the sphere of individual freedom, socialism restricts it. Democracy attaches all possible value to each man, socialism makes each man a mere agent, a mere number. Democracy and socialism have nothing in common but one word: equality, but notice the difference: while democracy seeks equality in liberty, socialism seeks equality in restraint and servitude." George Gilder - "The Real Issue is between the rule of law and the rule of leveler egalitarianism, between creative excellence and covetous "fairness", between admiration of achievement versus envy and resentment of it'. Thomas Jefferson - "The issue today is the same as it has been throughout all history, whether man shall be allowed to govern himself or be ruled by a small elite." Judge Leonard Hand - "Liberty lies in the hearts of men and women; if it dies there, no constitution, no law, no court can save it." Ludwig von Mises - "Modern civilization is a product of the philosophy of laissez faire, it cannot be preserved under the ideology of Government omnipotence." Ludwig von Mises - "The issue is always the same: the government or the market. There is no third solution." H.L. Menken - "Government is a broker in pillage, and every election is an advance auction on the sale of stolen goods"
F.A. Hayek - "Perhaps the fact that we have seen millions voting themselves into complete dependence on a tyrant has made our generation understand that to choose one's Government is not necessarily to secure freedom." Detlev Schlichter - "Economics is the science of how we use social institutions such as private property and voluntary exchange on free markets to make the best use of scarce resources. The printing press tries to do away with scarcity." Thomas Sowell - "The God like approach to social policy ignores the diversity of values and the cost of agreement among human beings." Henry Hazlitt - "Whenever men are allowed liberty, and freedom of choice, they will make mistakes. Liberty is not a guarantee of omniscience. But neither are the mistakes of free men a valid excuse to take away their liberty, and impose Government controls in its stead, on the ground that all wisdom and disinterestedness resides in the people who are going to do the controlling." Thomas Sowell - "Nothing is easier than to confuse broader powers with deeper insight. But almost by definition, those with the broadest powers are the most remote from the specific knowledge needed for either deciding, or for knowing, the actual consequences of their decisions." Ludwig von Mises - "Credit expansion is the Government's foremost tool in their struggle against the market economy. In their hands it is the magic wand designed to conjure away the scarcity of capital goods, to lower the rate of interest or to abolish it altogether to finance lavish Government spending." Ludwig von Mises - "Economic history is a long record of Government policies that failed because they were designed with a bold disregard for the laws of economics." Chaderov - "Since the State thrives on what it expropriates, the general decline in production that it induces by it's avarice foretells its own doom. Its source of income dries up. Thus in pulling society down it pulls itself down." Thomas Sowell - "If an informed citizenry is the foundation of democratic Government, than an uninformed citizenry is a danger." Thomas Sowell - "The free market works best when there is a level playing field but politicians win more votes by tilting the playing field to favor particular groups." Thomas Sowell - "However dramatic or attractive a particular vision may be, ultimately everyone must live in the world of reality. To the extent that reality has been filtered to fit a vision, this filtered information is a misleading guide to making decisions in an unforgiving reality, to which we must all adjust because it is not going to adjust to us." Thomas Sowell - "Envy was once considered to be one of the seven deadly sins before it became one of the most admired virtues under its new name "Social Justice"." Murray Rothbard - "Bureaucracy incompetent enough to plan a stationary system, is vastly more incompetent at planning a progressing one." Ludwig von Mises - "Freedom is incompatible with equality of wealth and income. Men are born unequal and it is precisely their inequality that generates social cooperation and civilization." Murray Rothbard - "Government subsidy systems promote inefficiency in production and efficiency in coercion and subservience, while penalizing efficiency in production and inefficiency in predation (plundering)." Francisco Capella - "The right of property is a negative right of noninterference. Humans do not have natural positive rights that imply that others must do something for them, and there is no natural duties towards others (present and future). Positive rights and duties arise by means of contracts." Victor Davis Hanson - "Social justice sees the Government's proper moral obligation not as ensuring equality out of the starting gate, but as guaranteeing that we will all reach the finish line at the same exact moment." F.A. Hayek - "A claim for equality of material position can be met only by a Government with totalitarian powers." Thomas Sowell - "People who are very aware that they have more knowledge than the average person are often very unaware that they do not have one tenth of the knowledge of all of the average persons put together. In this situation, for the intelligentsia to impose their notions on ordinary people is essentially to impose ignorance on knowledge." "Credentialed ignorance is still ignorance." Thomas Sowell - "People have to be aware of the dangers in letting economic decisions be made through political processes." 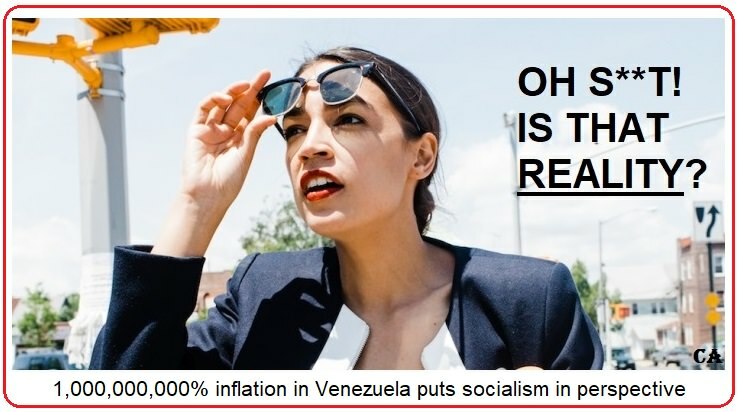 Winston Churchill - "Socialism is a philosophy of failure, the creed of ignorance, and the gospel of envy, its inherent virtue is the equal sharing of misery." George Gilder - "Socialist and totalitarian Governments are doomed to support the past, because creativity is unpredictable, it is also uncontrollable. If the politicians want to have central planning and command, they can not have dynamism and life. A managed economy is almost by definition a barren one. George Gilder - "The ambitious agenda of contemporary liberalism simply ensures that Government will do nothing well, except to expand itself as an obstacle of growth and innovation. Government best supports the future by refraining as much as possible from trying unduly to shape it." Francisco Capella - "Markets are never perfect because human beings are limited in their abilities; proposing state fixes to alleged problems that individuals cannot solve freely seems to forget that the state is also made up of humans; and perhaps not the best ones. ( Bureaucrats are not disinterested angels, and the worst might get to the top.)" George Washington - "Government is not reason, it is not eloquence, it is force, like fire it is a dangerous servant, and a fearful master." Thomas Jefferson -- "I think we have more machinery of Government than is necessary, to many parasites living on the labor of the industrious." Thomas Jefferson -- "I sincerely believe with you that banking establishments are more dangerous than standing armies; and that the principle of spending money to be paid by posterity, under the name of funding, it's but swindling futurity on a large scale." Thomas Jefferson -- "The two enemies of the people are criminals and Government, so let us tie the second down with the chains of the constitution so the second will not become the legalized version of the first."